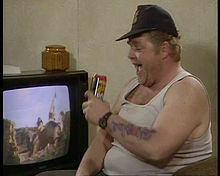 Geoffrey Hughes (Onslow in 'Keeping up appearances') died last Friday. The actor's chart, transits and progressions are here. The natal chart has a 'calling' Mercury (Mercury has no major aspects in sign or orb 5 degrees). That means that communicating, somehow, anyhow was very important to him. As Mercury happens to be rising before the Sun, the voice (means for communication) is important. With Venus square Neptune and the Moon in Taurus we can see part of the astrological pattern of artist talents*). There are three inconjunctions with Venus in the natal chart (coming from Mars, Uranus and Pluto). Quincunxes (and especially three of them) often refer to illnesses. Progressed Mercury was square Pluto when he found out (on October 4, 2010) that there was a (prostate) cancer relapse. At the time of his death we see transit Saturn sextile natal Jupiter. Also transit Pluto was inconjunct natal Mars (in the natal chart there is a tight sextile between Mars and Pluto; the resonation intensifies the nature of the aspects). Transit Pluto is inconjunct his natal Pluto. Progressed Mars is opposition natal Venus (natal chart: inconjunct) and semi sextile Node (natal chart: sextile). The combination of Venus, Mars, Node and Pluto might refer to a gender related problem. The inconjunctions (and semi sextile) refer to illnesses (and losses). A sextile (IMO) mirrors the easy way out (he died peacefully in his sleep). May he rest in peace! *) The astrological pattern of artistic talents consists of aspects between Moon, Venus and Neptune, placements in the related signs Cancer, Taurus, Libra and Pisces and a connection with Midheaven (for the professional). See the examples on this blog.